Status:Well,Larry is still quicker and swims about much more than Bob ever did. Real Name You can't figure it out, detective? Well, I am a 3 year veteran on this great wiki. I have formulated a plan to take over the Mushroom Kingdom, and I am willing to give it to any one that asks. Blue Yoshi, Light Blue Yoshi, the Yoshi named Yoshi, Donkey Kong,Weegee, Petey Piranha, King Boo, Gooper Blooper, Bouldergist, Ganondorf, Meta Knight, Mr GaW, R.O.B/Ancient Minister, Snake, Bowser, Marth,Buzzy Beetles, Gorilla Grodd, The Marinox, and Fawful all... ROCK HARD!!!! 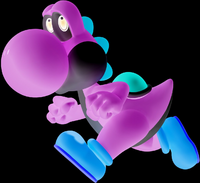 This User is Emperor Yoshi! This User is friends with Gamer2.1! This user is friends with Princess Yoshi. Atheist This user is a Atheist. It's a plus 70 % of all people are not good at mathematics. If you are part of the other 40 %, place this on your user page. 80px This user likes PIE! File:Brain small.png This user does in fact have a brain. This user likes to play the Spore series. This user thanks Steve for creating the Super Mario Wiki! This user HATES the duck hunt dog with a passion! This user knows what PINGAS means. IWBYD I would have been your daddy, but a dog bet me to it. Sprites This user has sprites.